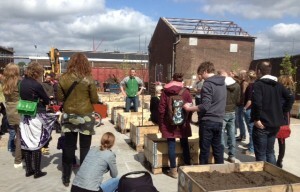 On sunday 13 th of April 2014 two enthousiastic citizens of Amersfoort, Kinke Hendriksma and Manon Hendrikx, launched the start of a small scale urban farming project ‘Nieuwe Stadsboeren‘. About 40 families adopted wooden grow boxes to grow veggies and fruit this season. In a former Unilever industrial estate called De Nieuwe Stad, now transformed to facilitate new business models and economy, urban farmer Gerben Bruins, from Boer aan Huis, developed a workshop to instruct parents and children how to grow their food. Earlier this week students of an agricultural school in Amersfoort helped to put together the boxes with public green entrepeneur Edgar van Groningen of 033Groen. At the last Smaak van de Streek markt in Amersfoort promotion for the boxes was so succesful that people subscribed to a waiting list. The project of Nieuwe Stadsboeren is a good example how stakeholders of the Local Support Network EEM in Amersfoort inspired and helped each other to create this project.